February 2017 – GIC news. “Welcome Aboard, But First U.S. Marshals Will Scan Your Retina,” published 2/25/2017. A bit of research uncovered that CBP announced a 2-month pilot program last year for flights between Atlanta and Japan in which they would be doing facial scans as passengers were about to board their flights:. This was, apparently, announced sufficiently quietly that I had not before heard of the program. The 2 month window has expired, and there is no mention on their Web site, that I can find, of a new program between Atlanta and Mexico. But, it seems to me that the likely scenario is that CBP has re-started this program and Mr. Tucker confused U.S. Marshals with CBP officers, and retinal scanning with face recognition scanners (not that it makes a difference in terms of our privacy). What exactly is the point of this? Are we hoping to catch someone who has overstayed their visa so that we can stop them from leaving, then take them into custody so that the taxpayer can fund their leaving? It may simply be a dumb idea, or it may be a far more sinister plan to further control the movements of everyone in the country, citizen or otherwise. Either way, count me out, and I encourage you to refuse as well. Author JollyBPosted on 28/02/2017 Categories USA News., Worldwide News. The European Debt Bomb Fuse Is Lit! 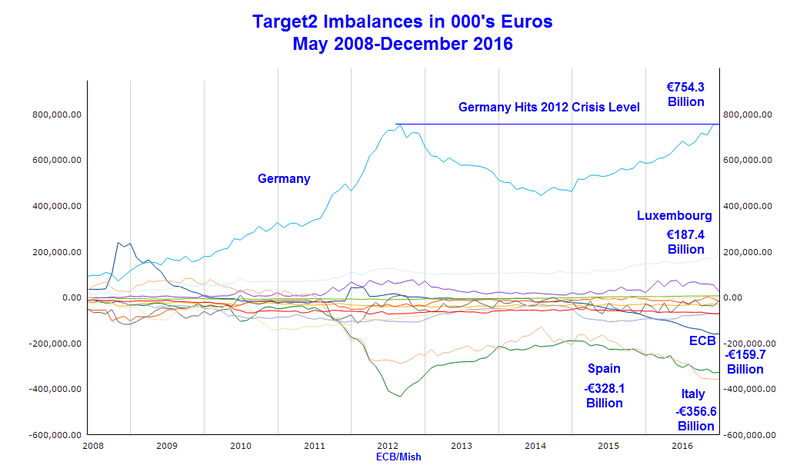 Eurozone Target2 imbalances have touched or exceeded the crisis levels hit in 2012 when Greece was on the verge of leaving the Eurozone. Others have noted the growing imbalances as well. I had a couple of questions for the ECB regarding Target2, which they have answered, I believe disingenuously. First, we will explain Target2, then we will take a look at various charts, viewpoints, and the email exchange with the ECB. Those numbers are as of December 2016. A check of the Bundesbank Target2 Balance as of January 31, 2017 shows a new record high of €797 billion. What’s the likelihood Italy could ever pay back €356.6 billion? Ambrose Evans-Pritchard at the Telegraph notes the unpayable debts then asks Are Eurozone Central Banks Still Solvent? As always, the debt markets are the barometer of stress. 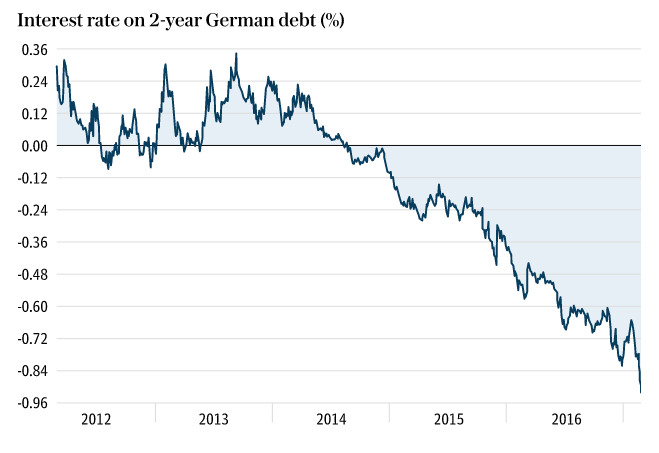 Yields on two-year German debt fell to an all-time low of minus 0.92pc on Wednesday, a sign that something very strange is happening. “Alarm bells are starting to ring again. Our flow data is picking up serious capital flight into German safe-haven assets. It feels like the build-up to the eurozone crisis in 2011,” said Simon Derrick from BNY Mellon. The Target2 system is designed to adjust accounts automatically between the branches of the ECB’s family of central banks, self-correcting with each ebb and flow. In reality, it has become a cloak for chronic one-way capital outflows. Private investors sell their holdings of Italian or Portuguese sovereign debt to the ECB at a profit, and rotate the proceeds into mutual funds Germany or Luxembourg. “What it basically shows is that monetary union is slowly disintegrating despite the best efforts of Mario Draghi,” said a former ECB governor. The Banca d’Italia alone now owes a record €364bn to the ECB – 22pc of GDP – and the figure keeps rising. Spain’s Target2 liabilities are €328bn, almost 30pc of GDP. Portugal and Greece are both at €72bn. All are either insolvent or dangerously close if these debts are crystallized. On the other side of the ledger, the German Bundesbank has built up Target2 credits of €796bn. Luxembourg has credits of €187bn, reflecting its role as a financial hub. This is roughly 350pc of the tiny Duchy’s GDP, and fourteen times the annual budget. Many media reports suggest the growing target2 imbalance in Italy is a sign of capital flight. ECB president Mario Draghi said it was a function of ECB asset purchases. Can you explain why Draghi is right or wrong? Please also explain the growing target2 imbalance at the ECB itself. Thank you for your email and please accept our apologies for the late reply. The implementation of the APP affects TARGET balances through cross-border settlement of our purchases. For more information on this particular mechanism, please see ECB Economic Bulletin, Issue 7 / 2016 – Box 2: TARGET balances and the asset purchase programme (pages 21-24). As regards the ECB’s own Target balance, when the ECB purchases securities under the APP, the ECB credits the account of the respective counterparty. Such counterparties are credit institutions, which cannot hold accounts with the ECB, but instead, hold accounts with national central banks. Therefore, payment for a security by the ECB automatically increases the ECB’s TARGET liability (but not necessarily the overall TARGET balance). This is discussed in the Bundesbank’s March 2016 Monthly Report (pages 53-55). I have been talking about Target2 imbalances for years, and I do not accept ECB’s response straight up. One of the barometers of tension in the Eurozone is the number of articles in the German press questioning the euro’s advantages to the country. The publication of the latest Target2 imbalances is not helping soothe nerves. As of end January, the German surplus was at an all-time record of €796 billion, while Italy’s deficit was at a record €364 billion. The ECB argues that the reason for the gap is not the same as it was during the Eurozone crisis when the imbalances reflected capital flight. Philip Plickert writes in FAZ that this argument does not tell the full story. It is true, of course, that international banks based in London sell bonds to the Bank of Italy from their Frankfurt-based branches – so that the asset purchases result in transfers of central bank money from Italy to Germany. But why do the sellers not replenish their portfolios with purchases of Italian bonds, shares or other assets? Instead, they take the money and invest in Germany. So this is still capital flight – except that it works indirectly through the asset purchase programme. The Banca d’Italia, Italy’s central bank, owes a record €364 billion to creditors, 22 percent of GDPand rising. The Banco de España, Spain’s central bank owes €328 billion to creditors, almost 30 percent of GDP. Other nations owe smaller amounts. Pater Tenebrarum at the Acting Man blog commented via Email “I agree with the eurointelligence view that the steep Italian and Spanish deficits are still a testament to capital shunning various countries. To put it very simply: people managing large sums of Other People’s Money for institutions subject to fiduciary duty continue to have doubts about the euro’s survival, and rightly so. Rating Agencies Where Art Thou? The rating agencies should be all over this issue but they are not. Here are two possible explanations. Target 2 is one of the least discussed and least understood problems in the Eurozone. Jens Weidmann, Bundesbank president, allowed nearly €800 billion in credit to build on his watch. One has to wonder: Is Weidmann moving into illegal territory? Alternatively, the Bundesbank and the ECB are going to print money to cover those losses! Greece alone is unlikely to trigger a crisis now, but Italy, Spain, or France could. The fuse is lit, multiple fuses actually. French Elections: Another “Unthinkable” Result Coming Up? Recent strength in gold is likely based on increasing doubts central banks are once again out of control. Of course, central banks were never really in control, but appearances matter. For further discussion, please consider Rate Hike Cycles vs. the US Dollar: Rate Hikes Bad for Gold? Author JollyBPosted on 27/02/2017 Categories Worldwide News. Brexit bombshell: Why is this parliamentary report talking about RE-JOINING the EU? DOWNING Street has slammed the contents of a commons report which advised Members of Parliament that the UK COULD RE-JOIN the EU. The report was circulated among MPs ahead of the crucial vote held in Westminster earlier this month and repeatedly referred to Article 49 which allows for the re-joining of the EU. In the wake of Theresa May’s famous “Brexit means Brexit” statement Express.co.uk pointed out the curious repeated references to the mechanism for re-joining the European Union. Today Downing Street has officially slapped down the report called “Brexit: how does the Article 50 process work?” which clearly points to a re-entry strategy developed by mandarins. The report states: “There is no provision for withdrawing the notification, but many analysts believe Article 50 is revocable and that the UK could change its mind about leaving the EU after notification and before actually withdrawing. “The revocability of Article 50 TEU was not raised in the Miller case before the High Court, but could be important. “If the UK wanted to re-join the EU in the future, it would have to re-apply under Article 49 TEU”. However when probed about the advice that was handed out to politicians and policy planners a Downing Street spokesman flatly denied there is any backdoor contingency plan being developed. He said: “We have been clear that we are committed to delivering on the will of the people and leaving the European Union. “There can be no attempts to remain inside the EU and no attempt to re-join it. “We want the best deal for the whole of the UK. “It is in no one’s interests for there to be a cliff-edge for business or indeed for the rest of the country. Theresa May is currently buoyed after the Conservatives shock election victory in the Copeland by-election. Tory Trudy Harrison won with 13,748 votes to 11,601 for Labour’s Gillian Troughton. Mrs May is also riding high with positive approval ratings as Jeremy Corbyn continues to fight off controversy in the crumbling Labour party. During the Article 50 Commons Vote two weeks ago there was drama with high profile resignations from the Labour front benches. The Conservative government sailed through the process with a comfortable win with 494 votes in favour to 122 against. The only Tory rebel to vote against the Government was Ken Clarke who had previously announced he enjoyed the limelight he’d been receiving as a result of his stance. No one from the SNP denied party orders to vote against the bill after Nicola Sturgeon’s posturing however it has already been ruled that devolved assemblies do not have a say after the Supreme Court judgement. A total of 616 MPs cast their vote on the issue with a total of 34 who did not take the opportunity out of the 650 constituencies in the United Kingdom. In terms of percentages the Government won the vote by 80.2 per cent to 19.8 per cent. The draft legislation is now set to move to the House of Lords but is a comfortable win for the Conservative party who will now be buoyed in their Brexit negotiations with the EU. Author JollyBPosted on 26/02/2017 Categories Worldwide News. Netherlands Looks To Join The Super-Snooper Club With New Mass Surveillance Law. The controversial new law will allow intelligence services to systematically conduct mass surveillance of the internet. The current legal framework allows security agencies to collect data in a targeted fashion. The new law will significantly broaden the agencies’ powers to include bulk data collection. This development clears the way for the interception of the communication of innocent citizens. Under the passed bill, Dutch security agencies may also share collected data without having analyzed it first. But when we hand over data to foreign governments without performing some form of data analysis prior to the exchange, we run the risk of not knowing what potentially sensitive information falls into foreign hands, and the consequences that might have for citizens. The mention of the safeguards of European law is significant. As we reported in December, the Court of Justice of the European Union (CJEU) confirmed that general and indiscriminate data retention is illegal in the EU. Assuming the Dutch law is passed as expected, a legal challenge at the CJEU could follow, and would seem to stand a good chance of getting the law struck down in its present form. Author JollyBPosted on 25/02/2017 Categories Worldwide News. The Deep State Oligarchs/Plutocrats Want To Keep America Drugged. As was predicted in Aldous Huxley’s Brave New World, the Elite have a vested interest in keeping their subjugated populace drugged to the maximum extent possible so that they do not ever wake from their stupor in order to challenge their soft (and sometimes overt) tyranny over them. Author JollyBPosted on 25/02/2017 Categories USA News., Worldwide News.